After months of negative attacks from his Democratic opponents, Mitt Romney is trying to turn his resume at Bain Capital into a positive for his campaign, arguing in a new Wall Street Journal op-ed that the experience he gained there would help him in the White House. "The lessons I learned over my 15 years at Bain Capital were valuable in helping me turn around the 2002 Winter Olympics in Salt Lake City. They also helped me as governor of Massachusetts to turn a budget deficit into a surplus and reduce our unemployment rate to 4.7 percent," Romney writes in the opinion piece published online late Thursday. "The lessons from that time would help me as president to fix our economy, create jobs and get things done in Washington." 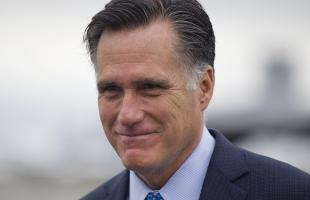 It's a message Romney and his aides have communicated previously on the campaign trail. But it still hasn't quite resonated with voters, amid withering attacks from President Barack Obama's re-election campaign and its allies over Romney's business record. In the Journal op-ed, Romney argues that his experience at Bain confirmed his "belief in empowering people" and gave him an up close look at how things like high energy costs and massive regulations impact businesses. Echoing a story that has already been the subject of a Romney campaign ad, the presumptive Republican nominee cites Bain's role in building up Indiana-based Steel Dynamics by equipping it with new technology. He says the experience taught him "that we must have a level playing field in international trade." "As president, I will challenge unfair trade practices that are harming American workers," Romney writes. Among other things, Romney says his time at Bain offered leadership lessons that will help him to take steps to reduce the federal deficit. He also argues that he knows first hand what it's like to start and operate a business—a sly dig at Obama, whom he's frequently criticized for lacking private sector experience and accused of being hostile to businesses. "I'm not sure Bain Capital could have grown or turned around some of the companies we invested in had we faced today's anti-business environment," Romney writes. "I know what it takes to turn around difficult situations," he adds. "And I will put that experience to work, to get our economy back on track, create jobs, strengthen the middle class and lay the groundwork for America's increased competitiveness in the world."